The summer poetry series "Seat in the Shade" kicks off July 11 with a slate of notable writers that include Georgia's poet laureate. The event is hosted by Melisa Cahnmann-Taylor, a professor in the University of Georgia College of Education. Poets Soham Patel and Jenny Sadre-Orafal will read on July 11. Patel is an assistant editor at Fence and The Georgia Review and is the author of several chapbooks and two full-length collections of poetry. Sadre-Orafai has written two books and five chapbooks, and her collection of poetry, Book of Levitations, will be published next year. The July 18 performance features Sabrina Orah Mark and Lemuel "Life the Griot" LaRoche. Mark has written two collections of poetry and her collection of stories, Wild Milk, will be published later this year. LaRoche is known in the Athens area for his groundbreaking work with the nonprofit Chess and Community, but is also internationally known for his poetry and spoken word and has written two books. 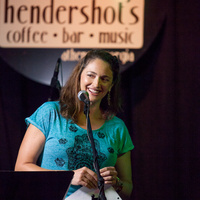 On July 25, Sharon Nuruddin and Dave Bottoms will take the stage. Nuruddin is a bilingual author and a doctoral student of language and literacy education in the UGA College of Education while Bottoms, Georgia's poet laureate, has published many collections of poetry and won numerous awards for his work. His poems draw from Southern imagery and narratives, including church hymns, bluegrass music and the natural world. The series concludes with a July 26 fireworks performance led by Cahnmann-Taylor, the author of three educational texts and a book of poems, Alex Johns, author of two books of poems and Word of Mouth series director, Josina Guess from Comer, Georgia; and Charlee Cain, a language educator and emerging poet. The performance is also a chance for Cahnmann-Taylor's students to flex their poetry muscles and perform what they wrote during the summer class. This is the first year this series has support from an Athens Arts Council "Arts In Community Grant" and a Georgia Literary Events Grant.